Twitter is useful for a lot of things. One of those things is information. I wanted to see if I could pull out the trash from the information. Answer, actually a really simple classifier with only about 300 labeled tweets can do a pretty good job. Right now it has no real interface except some output. I stopped work on the interface because it should be done in a web-technology, not processing. After trying multiple times on this exercise I decided I did not know how the weka classifying works and gave up. I had trouble changing the data from digits to my ad data and I couldn’t get it to take in any kind of image bigger than 10×10. How can I apply the histogram similarity sorting to the training data? This piece serves as a kind of open-ended barometer of the state of mind of the U.S., “measuring” how close we are today to our understanding of the American Dream. The piece makes this assessment based on the headlines of the day on the New York Times. The applet was trained on the NYTimes headlines from January 2009, and I classified each headline as evidence that we’re living the American Dream (“good”), or as evidence that the American Dream is not a reality yet (“bad”). TF-IDF was used to find the most important words of each headline and to compare to the day’s headlines. Everyday the headlines are downloaded and classified by finding the labels of the nearest neighbors (most similar training headlines). 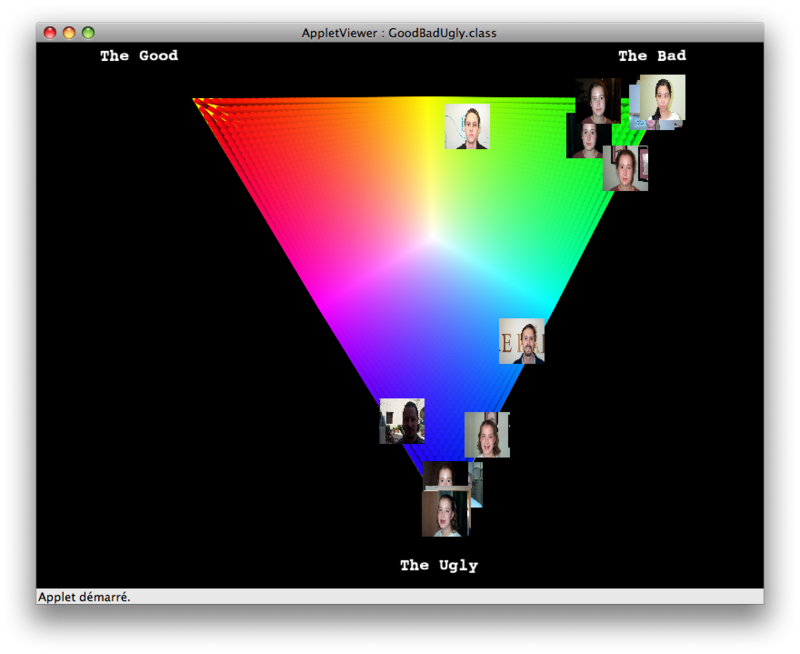 The ratio of “good” vs “bad” headlines is displayed as a line across the digital canvas (up = American Dream). Currently the applet is hard coded to use the headlines of the presentation day (March 17th). The code for finding the current date was found, but there wasn’t time to put the date into the needed form. The open-ended appearance intends to encourage viewers to interpret the messages “not there yet” or “almost there” according to their own beliefs and ideals. – create a web widget for NYTimes where people would get to rate headlines, maybe with a scale. This would multiply the training data received and “sharpen” the classifier. Also the classifier then would reflect a collective notion of the American Dream instead of only mine. – The headlines were chosen as the material to observe because each word in a headline is very carefully chosen but it might be that it’s not enough data to accurately predict the content of the piece. An alternative is to use the body of the article instead. This is a “test” for your sexuality. You answer some related questions, and the algorithm decides whether you’re a man or a woman. Your “identity” is the bigger circle at the center. The questions are the smaller ones. Mouse-over a question to see its description. If you agree with it, left click; if you strongly agree, click once more. Similar, if you disagree, right click, and click once more if you strongly disagree. If a node’s fill color is pink, it means you answered it like a woman is “supposed to”. If it’s blue, you answered it like a man. The color of the border represents how the computer thinks you would answer it. Gray means “undecided”. The questions are meant to be highly judgmental/prejudicial/stereotypical and sarcastic. Below is a screenshot. The runnable program is here (sorry I can’t provide the actual code; there’s some “researchware” involved.) Type “java Main” to run. I used the Belief Propagation algorithm to “propagate” each node’s status to that of the other nodes’. Exercise #4: would I like a song? I altered Carols and Barkin’s code for detecting hand written digits and used it to detect whether a face is smiling or not. It was 80% accurate testing 20 pics and using 80 as test data. // the first 100 digits will be used for testing, the rest as training data. I took sentences from the Torah, the Bible, and the Qu’ran to train a 3-way classifier (using bag-of-words, TF-IDF, svd, and logistic regression). The visual shows the “test examples”; sentences classified by the classifier, scrolling through the lines. The sentence’s color shows the true source it came from, and the color of the line it’s flowing through shows from which text it was classified to be by the classifier. Can you tell which color corresponds to which text? Green = Torah, Blue = Bible, Red = Qu’ran.